COMPRESOR DE AIRE CARROLL DIESEL 235 LTS 9 HP CAR-H235DAE9 | ARISA Maquinaria, S.A. de C.V.
COMPRESOR DE AIRE A DIESEL MOTOR 9 HP MPOWER , PRESIÓN 175LBS/PULG2, VOLUMEN 40 CFM, TANQUE HORIZONTAL DE 235 LTS. CABEZAL TX-50C, OPERACIÓN AUTOMÁTICA. CON PROTECCION EN BANDAS. COMPRESOR DE AIRE MARCA OAKLAND TANQUE DE 500 LITROS MOTOR ELECTRICO MARCA SIEMENS DE 5 HP TRIFASICO INCLUYE ARRANCADO Y GUARDA BANDAS. 175 LBS DE PRESION ALTA PRESION..!! 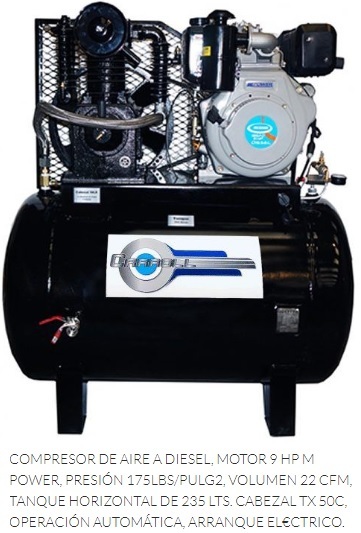 COMPRESOR DE AIRE, CABEZAL 3 HP/TB30, MOTOR ABIERTO BIFÁSICO 110/220 VOLTS 2 HP, PRESIÓN 115 LBS/PULG2, VOLUMEN 12 CFM, TANQUE VERTICAL DE 235 LTS.